Buy Skye and Lochalsh Echo a Coffee. ko-fi.com/skyeandlochalshecho - Ko-fi ❤️ Where creators get paid by fans, with a 'Buy Me a Coffee' button. 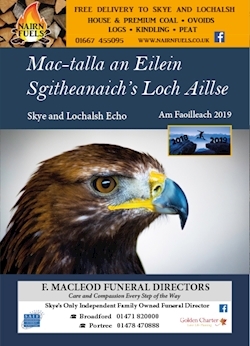 Skye and Lochalsh Echo is a community magazine that raises all it revenue from advertising income and donations. We receive no funding from any governent body or organisation. Welcome to our Ko-fi Page. If you enjoy the Echo content, please consider supporting us. Thank you. Secured Payments. Support goes to Skye and Lochalsh Echo's account. Upgrade Skye and Lochalsh Echo to a yearly Gold Membership with a one-time payment.